Sneaky English lop! Finnegan's parent wanted to add this disclaimer: "The cord Finnegan ate was only a USB cord that powers my laptop fan, and it wasn't plugged in at the time. All the other cords in our house are covered! 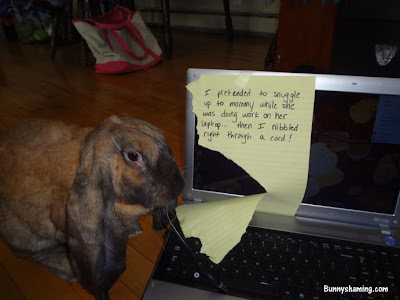 As you can see, Finnegan also tried to eat the note that documents his crime." Thanks for letting us know he is safe!